During our recent trip to the Myrtle Beach area, we took an afternoon excursion to a shooting range in Murrells Inlet. I had planned the trip as part of the "things we did at the beach" this year. I had remembered that there was a range near where we were staying from past trips to the area. Checking with all parts of the family in advance, I got an enthusiastic response from everyone. Thus, in addition to the pool toys and beach hut, we brought with us an assortment of pistols ranging from my Sig P238 to my Daewoo DH-40 with three various 9mm pistols in between. I also dug into my ammo stash so we wouldn't have to buy ammo at the range. Coastal Sports and Range in Murrells Inlet is a very nice gun store with an excellent, well-lit, 5-bay indoor range. When we got there, store manager Woodie Pitts greeted us warmly, discussed the range rules, inspected all my pistols and ammo, and helped us pick out targets. We also rented a Beretta Neo and a Ruger 22/45 for the new and newer shooters to use. The rangemaster Michael Wiestling went over the operations of both pistols with everyone before we entered the range. After donning our hearing protection and safety glasses, we went into the range area. It was separated into the five shooting bays and a glassed-in room where the non-shooters could watch. While there were nine of us in the party, only seven had originally planned to shoot. The Complementary Spouse's older daughter Wendy said she didn't feel comfortable shooting but did want to watch. That would change. Michael was a great help in not only explaining how the range controls worked but in working with the less experienced shooters. While I was getting the ammo and guns set out in two of the bays, he was providing the less experienced shooters instructions on grip, trigger control, and sight picture. Our party had three experienced shooters and four relatively new shooters. While my niece and nephew had shot handguns before, my sister-in-law Cindy had not and wanted to experience it. She strongly believes everyone should have some exposure to gun safety and at least know enough about guns to safely unload one. As you can see below, she went beyond that. Before the range time was over, she had shot both .22's, her sister's M&P, and my Sig P238. My niece Grace who had shot before likewise got to shoot both .22s and one of the 9mm pistols we brought as did her brother Grant. While all the afternoon was good, in my opinion the best moment came when Wendy turned to the Complementary Spouse and said, "I think I'd like to try it." And try it she did. With help from the rangemaster Michael and her Uncle Larry, Wendy not only shot the .22 pistols but tried her hand at shooting the 9mm pistols. Like the former athlete she was, Wendy took instruction well and did great. Like I said earlier, we arrived with seven shooters and left with eight including two first-time shooters. I think the smile on Laura's face below captures just how much fun we all had. If you are taking a trip to the Myrtle Beach area and want to take in some shooting, I can highly recommend Coastal Sports and Range. They were great and have a really nice gun store to boot. Tomorrow marks the 150th anniversary of the start of the battle of Gettysburg. The battle here marked the turning point in the War Between the States (or American Civil War). Confederate forces under General Lee never again ventured into Northern territory after this battle. On the second day of the battle, General Lee ordered an attack on the left wing of the Union line. Erroneous scouting reports said that there were no Union forces on either Big or Little Round Top. Lee, in essence, started the attack with erroneous information and with what he himself could see of the Union Army. A team led by geographer Anne Knowles of Middlebury College has created new interactive maps of the battle and the battle terrain for the Smithsonian Institute to commemorate this anniversary. "Our goal is to help people understand how and why commanders made their decisions at key moments of the battle, and a key element that's been excluded, or just not considered in historical studies before, is sight," Knowles said. Long before the advent of reconnaissance aircraft and spy satellites, a general's own sense of sight — his ability to read the terrain and assess the enemy's position and numbers — was one of his most important tools. Especially at Gettysburg, where Lee was hampered by faulty intelligence. "We know that Lee had really poor information going into the battle and must have relied to some extent on what he could actually see," Knowles said. The geographer applied GIS to find out what Lee could see and what he couldn't. To reconstruct the battlefield as it existed in 1863, researchers used historical maps, texts and photos to note the location of wooden fences, stone walls, orchards, forests, fields, barns and houses, as well as the movement of army units. High-resolution aerial photos of the landscape yielded an accurate elevation model. All of it was fed into a computer program that can map data. Lee is believed to have surveyed the battlefield from a pair of cupolas, one at a Lutheran seminary and the other at Gettysburg College, both of which yielded generally excellent views. But a GIS-generated map, with illuminated areas showing what Lee could see and shaded areas denoting what was hidden from his view, indicates the terrain concealed large numbers of Union soldiers. A screen cap of this map showing what Lee could and couldn't see is below. The gray areas indicate what was hidden from Lee's sight by the topography of the battlefield as he looked down from Seminary Ridge. I think the Smithsonian has done a great service with these interactive maps as they lead to a greater appreciation of the decision making by both Confederate and Union generals at this battle. The interactive map can be reached here. My jaw clenches and my teeth grind every time I hear a politician or a media sort say that so-and-so is a "lifetime member" of the National Rifle Association. I sincerely doubt what they mean is that the person in question has been an annual member of the NRA from an early age and has renewed said membership continually over the years. What I presume they mean to say is that the person is a Life Member or one of its more expensive variants of the NRA. From the Huffington Post - "Elaih Wagan, 3-Year-Old Texan, Honored By NRA As Youngest Lifetime Member"
For Manchin and his top aides, the dispute with the NRA has become increasingly personal. Manchin’s chief of staff, Hayden Rogers, a lifetime NRA member, has let his membership to the group lapse. Rogers even pulled the pro-NRA sticker off his own truck. After the recipients read their essays, Wise was introduced and began speaking about her passion for the rights of the second amendment. “I’ve been a lifetime member of the NRA (National Rifle Association) since I was 21,” she shared. One news organization that did get it right was Townhall.com. Remember the kid who was suspended for biting his PopTart into the shape of a gun (or was it Idaho)? And what about that 7-year-old boy from Maryland who was suspended for two days because he bit a Pop-Tart into the shape of a gun? Well, as for the latter, he’s been given a Junior Life Membership in the NRA. I know most in the mainstream media look upon the five million of us who are members of the National Rifle Association with utter disdain. That said, I still wish they would be more precise when describing those of us who are Life Members. The quote of the day comes from a resident of High River, Alberta. That Canadian town of about 13,000 about 25 miles south of Calgary has been evacuated from the greater part of a week due to the flooding of the Highwood River. Residents there are not only angry that they are not being allowed to return to their homes but that the RCMP or Royal Canadian Mounted Police had gone house to house and confiscated their firearms. Video of the confrontation between residents of High River and the RCMP is below. As a followup, the Solicitor General of the Province of Alberta announced today that he is working with the Mounties to assure a speedy and timely return of the seized firearms to their owners. The Maine State Legislature passed a universal background checks bill on June 19th in what was considered a surprise vote. The bill had been defeated twice before in the State Senate. In a surprise vote Wednesday, the Maine Senate passed a bill that creates civil penalties for those who sell guns in private sales to people who are prohibited from having them. The legislation imposes a civil fine of $500 if a gun seller does not perform a background check and the buyer is later discovered to be a prohibited person. The bill, LD 1240, was first watered down by the Senate, but on Tuesday, the House of Representatives sent the original measure back to the Senate. The Senate approved the bill on a 18-17 vote, with two rural Democrats joining Republicans in the minority on the measure. Fortunately for Maine gun owners, Gov. Paul LePage (R-ME) was true to his word and vetoed the bill. He said the bill only impacted honest gun owners and for that reason he vetoed the bill. Yesterday, the Maine State House voted to uphold the governor's veto in a 77-71 vote. The gun prohibitionists in the State House are now threatening to go to a referendum to pass the measure and cite the misleading poll number from an anti-gun push poll. In his veto message, LePage said the bill was focused "on those who would choose to obey the law, and for that reason I believe it misses the target." "This is an issue that may need to go straight to our citizens," Dion said in a statement after the vote. "The governor described my bill as 'well-meaning,' but public policy requires more than intentions, it requires action." Dion was referring to a potential referendum on the matter: J. Thomas Franklin, president of Maine Citizens Against Handgun Violence, a pro-gun control group, said last week that it is considering bringing a citizens' initiative to ask Maine voters to decide on mandatory background checks in 2014. Searching the Maine register of lobbyists, I cannot find any that represent Mayor Bloomberg's Illegal Mayors nor any that represent other gun prohibitionist group. I am going to assume that Bloomberg didn't employ his full court press like he did in Colorado and Nevada. Still that a state like Maine with a long tradition of protecting gun rights would have even considered such a bill - much less passed one - is disappointing. Maine, like the rest of northern New England, is changing and, in my opinion, not for the better. It appears that NC Speaker of the House Thom Tillis might be going wobbly on HB 937 and is also spreading misinformation on the position of Grass Roots North Carolina. With Tillis now an announced candidate for the US Senate to run for the seat held by Sen. Kay Hagan (D-NC), it is time to ramp up the pressure on both Tillis and the rest of the Republicans in the North Carolina House. It has come to our attention that the office of NC House Speaker Thom Tillis has told callers that GRNC "supports" removal of the pistol purchase permit repeal from House Bill 937 and the replacement of the measure with a study commission. That is a misstatement of GRNC's position. With less than two weeks remaining in the legislative session, it became clear that Speaker Tillis, faced with Governor McCrory's acquiescence to demands by the NC Sheriffs' Assoc. to remove the purchase permit repeal, might simply kill the entire bill by bringing it to the floor and re-referring it committee, where it would languish, rather than choosing between gun owners and sheriffs. Meanwhile, input we have received suggests that gun owners are of two minds: One faction notes that the purchase permit repeal was not in the original bill, and that the substantial gains of restaurant carry, campus carry, assemblies for which admission is charged and more should not be risked for one provision we might be able to get later. Others want us to stand strong for the repeal because other aspects of the bill primarily benefit concealed handgun permit-holders more than other gun owners. To those who have suggested we simply "amend" HB 937 to remove the purchase permit language, however, we are compelled to note that bills are not amendable on concurrence votes. The only option is for the House not to concur, in which case the bill goes to a conference committee comprising members of both chambers. Please note: Once the bill is in conference, we have no direct control over what comes out. The single and only alternative if we don't like what results would be to kill the bill in its entirety. It is for that reason GRNC has opposed sending the bill to conference. In the position just sent to the NC House, GRNC continues to admonish legislators to vote for concurrence. Acknowledging that it is critical to keep the bill moving as the end of the session approaches, however, we also advised them that we will not track the vote on concurrence PROVIDED that the bill is not otherwise weakened in the conference committee. Although we cannot speak for other organizations, representatives of both the NRA and NCRPA have expressed support for the position. 3. Inclusion of key legislators whom we can trust on the committee. If, however, a weaker bill leaves the conference committee, any legislator who voted to send it to conference will be assessed as having voted against the interests of gun owners, which will be reflected in "Remember in November" candidate evaluations. This is intended to give the less resolute members of the Republican caucus "ownership" in what the committee produces. In particular, there is one "deal killer" which may cause GRNC to oppose the bill: Shortening the duration for which purchase permits are valid, which is currently five years. Doing so would punish lawful gun owners for the malfeasance of the Sheriff's Association, which has known about and refused to address the system's flaws for decades. EMAIL ALL NC HOUSE REPUBLICANS: Tell them they don't have a "get-out-of-jail-free" card to vote against gun owners. If they vote against concurrence and HB 937 is weakened in conference committee, THEY WILL BE HELD RESPONSIBLE. If they want the best and safest course of action, THEY SHOULD VOTE TO CONCUR. To email House Republicans, use the copy-and-paste email list below and either the suggested message or one of your own. Suggested Subject: "Vote for concurrence on HB 937!" Although a campaign by the North Carolina Sheriffs' Association to preserve sheriffs' power and money seems destined to send House Bill 937 ("Amend Various Firearms Laws") to a conference committee, I strongly urge you to vote against any motion not to concur (i.e. to concur with Senate changes) as the best and safest method of guarding against wholesale weakening of the bill. I will be closely monitoring this matter via Grass Roots North Carolina Alerts. A coalition consisting of the Second Amendment Foundation, the Citizens Committee for the Right to Keep and Bear Arms, and Tom Gresham of Gun Talk have served a Freedom of Information Law request on the City of New York to provide all records concerning Mayor Bloomberg's Illegal Mayors and the use of city funds to support the group. It is an effort to smoke out just how much the citizens of the City of New York are paying for Bloomberg's pet project. BELLEVUE, WA – The Second Amendment Foundation today has filed a Freedom of Information Law (FOIL) request with the City of New York for all records relating to Michael Bloomberg’s Mayors Against Illegal Guns, after newspaper allegations that city resources have been used for MAIG’s gun control efforts. Gottlieb has called on New York Attorney General Eric Schneiderman to launch a full-scale investigation into the mayor’s potential misuse of public resources for his own private war on gun owners. He renewed that call today. “If Eric Schneiderman won't investigate Bloomberg for possible misuse of public funds,” Gottlieb said, “we will. The mayor has been acting increasingly like a self-appointed monarch, but this still the United States, not Bloomberg’s personal fiefdom." Given that other states and cities have strong freedom of information laws and given that there are a number of cities with a mayor belonging to MAIG, I think this provides a nice template for a grass roots effort to smoke out the use of public funds to promote gun control efforts. These politicians are like cockroaches and hate to see the light of day shone on their activities. The group Free Colorado is holding an event on Saturday in Glendale, Colorado called The Farewell to Arms Festival. Free Colorado's mission is to engage in targeted actions to reverse Colorado laws that imperil the rights of law-abiding firearm owners; and ensure that no other State passes such reckless government regulation. The event is meant to highlight the July 1st start of Colorado's ban on standard capacity magazines. 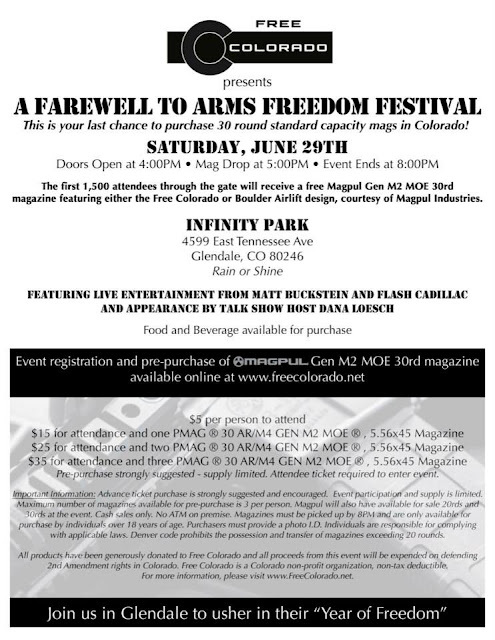 The first 1,500 attendees will receive "a free Magpul Gen M2 MOE 30rd magazine featuring either the Free Colorado or Boulder Airlift design, courtesy of Magpul Industries." There will be live music and an appearance by conservative talk show host Dana Loesch. If you are in the Denver area and support gun rights, you ought to take advantage of this. More details are in the flyer below. Chicago is now jumping on the bandwagon of proposing new gun laws before the Illinois concealed carry law is enacted. Mayor Rahm Emanuel has proposed a new assault weapon (sic) ban that would prohibit the sale and possession of such firearms in the city. From the report by WGN-TV below, it appears the bill will also contain a listing of such firearms and will also contain a magazine ban. The second bill introduced will ban the carrying of firearms in student safety zones. While I am not completely familiar with the concept, it appears that they include the sidewalks students most frequently use when walking to school. This second bill sounds like even more of an intrusion upon the Second Amendment than the Chicago AWB depending on just how broadly a student safety zone is defined. The second ordinance would make the punishment harsher for gun-related offenses in “student safety zones”. Those zones are found near schools, buses, and parks across the city. Anyone convicted of having a gun in a safety zone would face a fine of $1,000 to $5,000 for the first offense and a mandatory 30 days in jail. A second offense would carry a fine of $5,000 to $15,000 and a mandatory three months in jail. A third offense would carry a fine of $10,000 to $20,000 and a mandatory six-month jail term. Neither bill nor its text is posted on the City of Chicago's website as of now. Illinois Attorney General Lisa Madigan was granted a second extension of time in which to file an appeal in the joint cases of Moore v. Madigan and Shepard v. Madigan. Justice Elena Kagan granted the extension of time to file the appeal until July 22nd. The extension was granted by Justice Kagan on June 18th. One has to wonder if it had been Justice Thomas or Justice Scalia would Madigan have gotten her extension granted so easily. Unfortunately, the 7th Circuit is assigned to Justice Kagan for these type of matters. The whole issue would become moot if Gov. Pat Quinn signs the carry bill that was passed on June 4th by the Illinois General Assembly. Madigan's father, House Speaker Michael Madigan, is urging Quinn to do just that. The Chicago Democrat's office said Tuesday that the governor has not decided what action he'll take on the legislation. The attorney general's office released Kagan's order but did not have an immediate comment. House Speaker Michael Madigan - the attorney general's father and a fellow Chicago Democrat - urged Quinn to sign the bill, which was a hard-fought compromise between the House and Senate. "If you look at the vote in the House and the Senate it's pretty clear that the governor's veto could be overridden," Madigan said after an unrelated committee hearing Tuesday. As Sebastian noted when Madigan requested the second extension, this is getting ridiculous and it is time for Illinois politicians to stop playing games. The North Carolina Senate took the House-passed HB 937 and made a good gun reform bill into a near great one. The North Carolina Sheriffs' Association in now balking on passage of the bill due to the elimination of the archaic and racist pistol purchase permit system run out of each county's sheriffs' department. As the alert below from Grass Roots North Carolina makes clear, what they really object to is a loss of power and a loss of revenue. News stories about the recent shooting in Greenville, North Carolina are now trumpeting that the Pitt County Sheriffs' Department had turned down the shooter for a "gun permit" last year. The only problem is that North Carolina doesn't have a "gun permit." If what they are saying is that he was turned down for a pistol purchase permit by the sheriff, it certainly didn't stop the shooter from obtaining the shotgun which he used to wound four people. Nowhere in any of the stories about this shooting is mention made of just how the shooter did obtain the shotgun. He may have owned it for years, he may have stolen it, or he may have legally purchased it after a NICS check. We don't know but I would wager the reason we are hearing that the shooter was turned down for a "gun permit" is part of the effort to stymie HB 937. In recent days, the North Carolina Sheriffs’ Association (NCSA) has flip flopped on its support for HB 937, a common sense bill that would modernize North Carolina’s gun laws, and allow law-abiding citizens to better defend themselves and their families from predators who do not pay attention to gun laws. The reason for the NCSA’s reversal on this bill clearly revolves around the money the sheriffs collect, and the power they maintain, through our State’s outdated pistol permit system. Aside from the fees the sheriffs are currently charging in the current system, each county’s sheriff has unlimited power to decide who may or may not purchase a handgun. That means your county’s sheriff can arbitrarily deny anyone their Second Amendment rights, absent any due process. For these reasons: money and power, the NCSA does not want this shameful, Jim Crow-era leftover to be eliminated. But HB 937 would do just that. It would eliminate it, and replace it with the fair and reliable National Instant Criminal Background Check System (NICS). This is a dependable, computerized system that has been tried and tested, and in thirty-six states it is the sole background check system, eliminating old-fashioned pistol permits. The NCSA Says: NICS obtains criminal records from North Carolina only regarding persons who are fingerprinted, which includes felons and some limited categories of misdemeanants. Many misdemeanants, punishable for up to two years in prison, are not fingerprinted and, therefore, are not reported to NICS. The Fact Is: People convicted of state-level misdemeanors punishable by less than two years are not prohibited from owning firearms under federal law, meaning sheriffs want discretion to deny permits to people who are not prohibited. The NCSA Says: North Carolina state law only requires the Clerks of Superior Court to report to NICS a limited category of those persons involved in an involuntary mental health commitment. The Fact Is: According to the FBI, the NICS database encompasses: A person adjudicated mental defective or involuntarily committed to a mental institution or incompetent to handle own affairs, including dispositions to criminal charges of found not guilty by reason of insanity or found incompetent to stand trial. The NCSA Says: Persons from North Carolina who are prohibited by federal law from possessing a firearm, but who are likely to not be discovered by a NICS check, are persons who: Are under indictment or information in any court for a crime punishable by imprisonment for a term exceeding one year; Have been convicted of a crime punishable by imprisonment for a term exceeding one year; are fugitives from justice; are unlawful users of or addicted to any controlled substance; have been adjudicated as mentally defective or have been committed to any mental institution; Who are subject to a court order restraining them from harassing, stalking, or threatening an intimate partner or child of the intimate partner; or Who have been convicted of a misdemeanor crime of domestic violence. The Fact Is: The FBI says otherwise. Their description of the contents of NICS cover all of the situations that the NCSA mentions above. The NCSA Says: The pistol purchase permitting process in North Carolina is currently far superior to the NICS check and provides increased public safety for our citizens. The Fact Is: For rifles and shotguns, the NICS is already used in North Carolina, and without objection from the NCSA. If NCSA considers NICS to be an inadequate means of background check, why has it not objected to its use as the sole background check system for long guns? The NCSA Says: Sheriffs’ “local knowledge” gives them familiarity with local residents that goes above and beyond what the NICS can provide. The Fact Is: NCSA's "local knowledge" argument is a stretch. Although sheriffs claim that familiarity with local residents gives them knowledge above and beyond that provided by NICS, the argument is rife with flaws. Just one example would be the fact that Mecklenburg County has processed 12,000 permits thus far for 2013. Is it the position of the NCSA that sheriffs in large counties routinely check tens of thousands of households? Unlikely. The NCSA needs to get its facts straight, and the antiquated pistol permit system needs to be replaced with a proper, twenty-first century alternative. It’s also a fact that the NCSA’s misguided opposition to this one provision in HB 937, threatens to derail the entire bill. That’s a real problem. Tell Speaker Tillis and the other elected members of the NC House that you’ve had enough of our outdated, Jim Crow pistol permit system. Call Speaker Thom Tillis, and ask that he bring HB 937 forward for a vote, and that he encourage his colleagues to vote for concurrence: 919-733-3451. Suggested Subject: "Sheriffs' Association Spreads Misinformation about Purchase Permits"
I have recently become aware that the North Carolina Sheriffs’ Association (NCSA) has been distributing misinformation about our State's archaic pistol permit system, an outdated system that HB 937 seeks to replace with modern, computerized background checks. The NCSA has gone so far as to refer to the current system as "superior" even though it still contains the "arming felons loophole." I am writing to inform you that I strongly support HB 937, as currently written, and I would consider a vote against concurrence to be an anti-gun vote. I encourage you in the strongest terms to vote for concurrence in order to strengthen and modernize our State’s gun laws. Originally, the NCSA had supported the bill entirely, and even now they still claim to support it, but only oppose the provision that removes the purchase permit requirement. The NCSA seems desperate to hang on to last century’s permitting method, no doubt so they can continue to use it to collect fees that they are currently attempting to double, and to maintain unchecked power over who can obtain a pistol permit. I have done my research, and I strongly disagree with the NCSA’s new position. I’ve learned that thirty-six states are already using the dependable, computerized National Instant Criminal Background Check System (NICS) as the sole means of conducting background checks. I also know that the nature of our outdated pistol permit system opens the door for dangerous criminals to buy guns with pistol permits that were legally obtained before the criminals committed their crimes. These old-fashioned paper permits are not traceable nor are they revocable, and they remain valid for years. This “handguns for felons” loophole would be eliminated through use of the NICS. The NICS is also a fair system in which everyone can expect to be treated equally under the law. Through the NICS, sane, law-abiding citizens cannot be denied their Second Amendment rights for arbitrary reasons. This is something that cannot be said of the current pistol permit system, which can be used to subjectively deny any citizen a pistol permit without due process. That is just wrong, and it’s time to do what’s right. Again, I ask that you vote for concurrence on HB 937. A vote against concurrence would indeed be an anti-gun vote. Please do what’s right, and bring North Carolina’s gun laws into the twenty-first century. I will be monitoring your actions via Grass Roots North Carolina legislative alerts. The Illinois State Rifle Associations issued an urgent alert this afternoon about a number of city and town council meetings scheduled to enact new gun bans. The rush to pass these new bans are a result of the recent passage of concealed carry in Illinois. 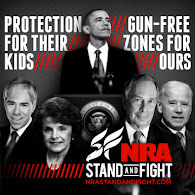 For the past 6 months or so, law-abiding gun owners like you have been the targets of an intense campaign of vilification, slander and misrepresentation from the likes of Obama, Biden, Bloomberg, Simon and Quinn. The gun grabbers have blamed you for mass murders, terrorist attacks on movie theaters and malls, and even the bombing of the Boston Marathon. And now, the anti-gunners are trying to hijack concealed carry legislation and transform it into a massive gun control scheme that will result in the banning and confiscation of most of the guns you own. Wait, but thats not all. . . the gun-haters plan for concealed carry also includes licensing, registration and the surrender of your privacy  whether you apply for a permit or not. As a law-abiding gun owner you should be sick and tired of all this nonsense. Its time for all of you to stand up and declare, . . .enough is enough! Its time to confront the gun grabbers and force them to stand down from their attacks on your constitutional rights. 1. Highland Park, IL. 1707 St. Johns Avenue, Monday, June 24, 2013, 7:30 PM (be there by 6:30 PM). Topic: semiautomatic firearm ban. 2. Evanston, IL. City Hall, 2100 Ridge Avenue, Monday, June 24, 2013, 7:15 PM (be there by 6:30 PM). Topic: semiautomatic firearm ban. 3. Melrose Park, IL. Police Station, One North Broadway, Monday, June 24, 2013, 6:00 PM (be there by 5:15 PM). Topic: semiautomatic firearm ban. 4. St. Charles, IL. City Council Chambers, 2 E. Main Street, Monday, June 24, 2013, 7:00 PM (be there by 6:15 PM). Topic: semiautomatic firearm ban. 5. Park Ridge, IL. City Hall, 505 Butler Place, Monday, June 24, 2013, 7:00 PM (be there by 6:15 PM). Topic: semiautomatic firearm ban. 6. Berwyn, IL. City Hall, 6700 26th Street, Tuesday, June 25, 2013, 8:00 PM (be there by 7:15 PM). Topic: semiautomatic firearm ban. 1. No matter where you live, you should plan on attending the closest meeting to you. Be prepared to bring a friend or two. Wear iGOLD hats and t-shirts. If you see members of the media, approach them and tell them that you are a law-abiding gun owner who is sick and tired of having others carelessly work to destroy your rights. 2. Take careful notes of what happens during the meeting. Take notes of who you talk to, what the topic of the discussion was, and note what is told to you by the other person. 3. Pass this alert on to your friends and family  ask them to attend as well. 4. Please post this alert to any and all Internet bulletin boards and blogs to which you may belong. Its time to launch a major counteroffensive against the gun control movement. This is the week to do it. Please plan on attending one of these meetings. Remember, Gun Control is a disease  youre the cure. UPDATE: Here is a list of updates on what transpired at the council meetings in Illinois yesterday. Park Ridge: Meeting was postponed until JULY 8th 7:00pm. Power outage due to storms. Report of good turn out. Evanston: good turn out reports say 2-1 for us. No action likely tonight. Marengo: "After what I heard this evening, I doubt the City Council would vote for a ban," Mayor Donald Lockhart say. "There doesn't seem to be support for a ban." West Chicago: (dupage county) 30 or so showed up for us and every committee member was totally opposed to any legislation and recommended that nothing should be pursued. The Mayor of Park Forest has responded to inquiries, and there is nothing on the agenda at this time. There seems to be some wrong information out there. I am presenting an over view on the expected concealed carry law that the Governor will probably sign. It is so the CC knows what to expect and what current ordinances we have that will likely go away. Concealed carry will happen as you know in Illinois. Yes there is a preemption provision in the law about the assault weapons, but there is no ordinance being presented for discussion or approval. I have to cover that as part of the Concealed Carry law. I am not aware or have any direction from the Council at this point and have not pursued one as well. I do not know any of their individual positions on this topic. Thanks to Bloomberg's money and the anti-gun focus of the Democrats in the Colorado legislature, companies such as Magpul and HiViz sights are leaving that state. Thus when I read this story today about Trumark Slingshots expanding their operations in Boulder, it hit me. The gun prohibitionists want us reduced to using slingshots for our personal defense. Now don't get me wrong - a slingshot in the right hands, can be and is a deadly weapon. However, there are the limitations. To be accurate with one takes a lot of practice, it has a limited range, it is a one-shot weapon, and it is hard or impossible to use if you are weak, disabled, or maimed. There are a lot of uses for a slingshot but being your primary self-defense tool isn't one of them. UPDATE: Dennis at Dragon Leatherworks sent me a correction about the legality of slingshots in New York. Dennis is a refugee from New York and its draconian gun laws now living in the gun friendly state of Tennessee. Dennis told me he was happy to embarrass NY any time he had a chance. In NY, slingshots are illegal. So the Bloomberg prohibitionists don't want us even reduced to slingshots. (2) He possesses any dagger, dangerous knife, dirk, razor, stiletto, imitation pistol, or any other dangerous or deadly instrument or weapon with intent to use the same unlawfully against another; "
American Public Media's Marketplace which plays on many NPR stations has discovered that there is an ammo shortage. I mean, who knew? That is other than just about every gun owner, new or old, every gun store owner, and nearly every clerk in a Walmart store. This is the lead-in to a rather decent story about shooters reloading their own ammo and even casting their own bullets. Even more remarkable than the story is the fact that it isn't filled with anti-gun mythology. David Gura who reported on this story played it straight and should be congratulated for that. We've Got To Get Those Imaginary Guns Out Of Kids Hands! Oleg Atbashian is obviously a brilliant satirist. His take on Vice-President Joe Biden and a proposal for a buyback of imaginary guns is priceless. Inspired by the “Toy Gun” buyback program recently initiated by Hayward California’s Strobridge Elementary School principal Charles Hill, Vice President Joe Biden is scheduled to announce today White House backing of a new “Imaginary Gun” buyback program. Step One of the program would entail registration of imaginary weapons in a National Imaginary Terror Weapon Information Tracking System (NITWITS). Educators will help students fill out a form from NITWITS to see if their imaginations are producing unacceptable thoughts involving a weapon of any kind. Once the initial database has been created, “At Risk” students will be identified, removed from their regular classes, and subjected to a more rigorous investigation by NITWITS. A little over a week ago I had a post regarding news that an "industry leading firearms manufacturer" was considering the town of Mayodan in Rockingham County, North Carolina for a plant expansion. Officials at the time would not name the company in question but did rule out Remington Arms which is headquartered in nearby Madison. I speculated at the time that it would be Ruger because of remarks CEO Michael Fifer had made at the annual meeting. It turns out I was correct. The News and Advance of Rockingham County confirmed that it was Ruger holding the interviews with potential new hires. Darrell Freeman of Madison, Brad Young of Reidsville and Steven Sherwood from Davidson County heard about the manufacturer’s request for interview applications from different sources. Freeman said his wife saw an announcement on Facebook, while Sherwood heard a television news report and Young saw it on a news media’s website. The three new friends confirmed the company considering a Mayodan location was Sturm Ruger & Co. – a Connecticut-based corporation with manufacturing facilities in New Hampshire and Arizona. They also said Mayodan was one of three potential locations for a new manufacturing plant. How many people will be hired is still unknown. Kah said it would be a “meaningful number of employees,” somewhere in the hundreds. However, more jobs could develop. “Depending upon what lines were located (at the plant ) and how the growth went, it could be somewhere between 300 and 500 people,” Kah said. Kah went on to say that Ruger expects to make a decision in about two months. Graham Pervier of the Rockingham County Partnership for Economic and Tourism Development told WFMY-TV News 2 that they were encouraged but realized the other sites were still under consideration. Mayor Larry Morrissey of Rockford, Illinois was a member of Mayor Bloomberg's Illegal Mayors in good standing. Even this morning their website showed him as a member of their "coalition" as you can see in the screenshot below. I say "was a member" because Mayor Morrissey not only dropped out of MAIG yesterday but has indicated that he will be seeking a concealed carry permit as soon as it finally becomes law in the state of Illinois. His decision to seek a concealed carry permit is due to his receiving death threats in office for which the Rockford PD provided him extra protection. As he told the Rockford Register Star, "I don't want to put my family's life at risk or my own life at risk if I can otherwise protect myself." "The reason why I joined the group in the first place was because I took the name for what it said, against illegal guns," Morrissey said. Morrissey said he didn't expect the organization to get involved with banning magazine clips or "assault" weapons. "As the original mission swayed, that's when I decided it was no longer in line with my beliefs," Morrissey said. You have to wonder how many other mayors across the country were sold the line that all MAIG wanted to do was prevent criminals from having firearms as opposed to preventing everyone but Mayor Bloomberg's personal protection team from having firearms. In the meantime, Mayor Morrissey should be congratulated on the wisdom of his decision to not only distance himself from MAIG but to step and provide the protection himself for he and his family. If you want to congratulate him, contact information is found here. Where are Jim Corbett or Peter Hathaway Capstick when you need them? It seems something was preying on cats and dogs in Clark County, Indiana. Wildlife officials at first suspected a bobcat. However, when Indiana Department of Natural Resources examined a so-called bobcat shot one night, they discovered it was actually an immature leopard. Some suspect that the big cat escaped from a nearby wildlife refuge but the owner of Wildlife in Need denies any of his animals have escaped. It is now suspected that it was someone's pet leopard. Mayor Bloomberg's Illegal Mayors is bringing their 100 city bus tour to Raleigh, NC tomorrow at 9am. Unlike the Freedom Riders of the 1960s, this bus tour is seeking to curtail your civil rights which is why I call them the "anti-Freedom Riders". Grass Roots North Carolina plans a nice, warm Tar Heel welcome for Bloomberg's minions. Let's give Bloomberg's radicals a 'welcome' they won't forget! As you may have heard, New York Mayor Michael Bloomberg's "Mayors Against Illegal Guns" (MAIG) recently began a 100-city bus tour to push for federal gun bans. Although Bloomberg keeps the bus schedule secret to avoid actually hearing what people want, we have learned that the MAIG bus tour will hit Raleigh at 9:00 AM on Saturday. It's time to show the media and the world that Bloomberg does not speak for the nation by showing up at GRNC's "MAIG Counter Demonstration." Yes, the notice is short. No, you probably don't have time, or you have something else scheduled. . .
A peaceful counter protest to deliver a message to the media that "Guns Save Lives!" From the east: I-40E to Ex. 299 (Hammond Rd) toward Person St. Go 0.3 mi & turn left toward Hammond Rd. Go 108 ft & left onto Hammond Rd. Go 0.7 mi & continue onto S Person St. Go 1.0 mi & turn left onto E Martin St. Destination will be on the right. Firearms are prohibited by law at demonstrations and protests. Keep signs on message: GRNC will have a large number of lime green "Guns Save Lives!" signs which are highly effective at showing up on TV cameras, but you are free to bring your own. However, please don't use signs which could be used to depict us in a negative light, and stick to the pro-gun message. This is a peaceful counter demonstration: Do not engage in heckling or other altercations with the opposition. UPDATE: Kahr40 attended the event and has some pictures up on his blog here. I know Sean was there but he hasn't posted on it yet. UPDATE II: WRAL in Raleigh covered the event and gave time to both sides. Thanks to Sean for posting a link to the video below. The Second Amendment movie, Assaulted: Civil Rights Under Fire, opened yesterday and will be showing in a number of theaters across the country. It has been reviewed by papers ranging from the Washington Post to the OC Weekly. The reviews range from your typical gun prohibitionist's drivel in the Post to a rather thoughtful review in the OC Weekly. Here are the reviews and the places where the movie will be playing. Last night Assaulted: Civil Rights Under Fire opened in theaters across the country. We did it! Thanks to you. So take a couple of friends and enjoy the show. Finally, DVD and downloads will be ship/available in the fall. This delay is caused by the theatrical contract restriction of 90 days before the film can be released on DVD or VOD (video on demand). Mr. Colion Noir is very good at stripping issues down to their basics. In this video released a couple of days ago, he discusses arming teachers. He notes the gun prohibitionists object to it due to possible accidents. He points out the contradiction of saying that mass shootings don't happen frequently enough to justify arming teachers yet calling for more gun control when a Newtown shooting does occur doesn't make sense. Grass Roots North Carolina will hold their annual dinner and present their awards this Saturday in Raleigh. Featured speakers will be Prof. John Lott and James O'Keefe among others. Given that line-up, I'm disappointed that I can't make it to Raleigh for the event as I will have out-of-town guests in town. There are still a few tickets available for the GRNC 2013 Annual Dinner and Freedom Awards. If you hurry, you can still reserve your seats. This year’s event features renowned researcher John R. Lott and ACORN-busting James O'Keefe, and there are a few added bonuses (see below). In the war for truth and individual liberty, some warriors distinguish themselves. Because those who do deserve recognition, GRNC is holding the "2013 GRNC Annual Dinner & Freedom Awards," including an opportunity to meet national figures in the gun debate. John R. Lott, internationally renowned researcher and author of "More Guns, Less Crime." James O'Keefe, president of Project Veritas, and maker of secretly-recorded videos that "outted" leftists at ACORN, Planned Parenthood, and National Public Radio. Bill LuMaye, ardent gun rights supporter and conservative talk show host for Raleigh's WPTF Radio. Rep. Larry Pittman, courageous NC House Representative and arguably the most pro-gun member of the legislature. Recently, you may have heard James O'Keefe discussing his new book: “Breakthrough: Our Guerilla War to Expose Fraud and Save Democracy” on Sean Hannity’s radio and TV programs, or on the “The Factor” with Bill O’Reilly. The new book was just released on June 18th, and he will be signing them at Saturday’s dinner. John Lott will also be signing copies of his recent book: "At the Brink: Will Obama Push Us Over the Edge?" This is a unique opportunity to go to the range & shoot with James O'Keefe while supporting your 2nd Amendment group! GRNC will be holding a silent bid for our Political Victory Fund. The highest bidder and one additional randomly drawn GRNC-PVF contributor will join O'Keefe Sunday, June 23rd at Personal Defense and Handgun Safety Center for some shooting action. Be ready for this opportunity & we will have the bidding forms available at the dinner on June 22. Each reservation to the GRNC Annual Dinner will receive a ticket for GRNC's next AR-15 GIVEAWAY: Likely less than 200 tickets will be issued! You do NOT have to be present at the dinner to win, you need only make a dinner reservation as described below. Dinner: 1st ticket, $50; 2nd & subsequent tickets, $40 each. Please RSVP for the VIP Reception via e-mail: DirectorOfDevelopment@GRNC.org. (Free to GRNC Benefactor members, PRO RKBA Benefactor Sponsors, and active volunteers. For complimentary tickets, contact: DirectorOfDevelopment@GRNC.org). There are still some tickets available, so order yours ASAP! It is a study in contrasts. On the one hand you have Horry County, South Carolina and on the other is the state of Connecticut. The former offers a warm welcome, tax incentives, a nice climate, great beaches nearby, and a political community including Gov. Nikki Haley (R-SC) who not only are pro-gun but actually want you and your products in their state. The latter has passed laws that has outlawed the sale of your only product in that state, has cold and dreary winters, a higher cost of living, and has a governor in Daniel Molloy (D-CT) who considers you the devil incarnate. Given this, it is isn't surprising that PTR Industries has chosen Horry County over Connecticut. It was announced yesterday at a meeting of the Horry County Council that they would be moving to the town of Aynor. The company — which said two months ago that it would be relocating once it found a suitable location "friendly to the industry" — will move to Aynor, S.C., near Myrtle Beach, said John McNamara, vice president of sales at PTR. The gun manufacturer, with about 45 employees, was the first firm to announce its exit from the state following recent gun control legislation. Many of PTR's employees agreed to the move and even held an informal vote choosing South Carolina over other states. PTR currently has 45 employees at its plant in Bristol, Connecticut. They estimate that 24 of those employees will make the move to South Carolina. According to the Myrtle Beach Sun News, PTR has committed to increase their workforce to 80 by the end of the first year and to 145 employees by the end of 2016. This means the majority of the company's employees will come from the local Horry County workforce. According to my conversations with PTR representatives at the NRA Annual Meeting, they have been growing rapidly. Their current workforce is double what is was a year ago. Some details of the agreement between Horry County and PTR Industries still remain undecided, including the amount of a fee in lieu of taxes the county will agree to and the millage rate at which the company’s equipment and other personal property will be taxed. Those details will be included in actions Horry County Council must now take to solidify the agreement. The council will have to take three votes on the agreement, one of which will include a public hearing. The county, state and Horry Electric Cooperative will fund upgrades to the shell building where the company will move, but those costs will be repaid by the company during the first two years of its lease of the building. It will pay the county $300,000 annually for the next nine years to lease the building, after which the county will deed it to PTR. Lofton said the company wants a building that can be expanded. The shell building now has 58,000 square feet but can be expanded to 100,000 square feet, he said. The company will invest $3 million in the building and has committed to an additional $5 million investment, including the cost of equipment, according to the agreement in the resolution. If PTR doesn’t meet the benchmarks in the agreement, it will be responsible for the full amount of taxes, including that from state tax credits for job creation, that it would have paid without the agreement. And it looks like PTR is not the only Connecticut firearms manufacturer looking at Horry County. Both the Hartford Courant and the Myrtle Beach Sun News are reporting that Stag Arms is also being courted by the county. Mark Malkowski, CEO of Stag Arms, is scheduled to visit the area next week. This report by FoxCT details some of the effort by South Carolina officials to persuade Connecticut companies to relocate. The Colorado Secretary of State's Office has confirmed that the backers of a recall election for Senate President John Morse (D-Colorado Springs) submitted more than enough signatures to force a recall. The Denver Post reports that the El Paso Freedom Defense Committee obtained 10,137 valid signatures out of over 16,000 submitted. They only needed 7,178 verified signatures to force the recall. Morse supporters are trying to say that the recall petition had "improper language" and should be tossed out. A Whole Lot of People for John Morse, the group backing him, said Tuesday its protest "would nullify the purported sufficiency of the signatures." They argued the organizers failed to use proper language as defined by the Colorado Constitution requiring petitions "expressly include a demand for the election of a successor to the recalled official." Mark Grueskin, a prominent election lawyer who is representing a Morse constituent who filed the legal challenge with the secretary of state Tuesday, said, "The constitution is clear, just as the courts are clear: No recall petition is valid without this specific language." In a recall election, the ballot asks two questions: Should "so and so" be recalled, and "if so, then who should" be the successor. Grueskin said organizers failed to use such wording in their petition language that notifies signers that a recall is a two-part process. The legal counsel for the Colorado Republican Party dismisses this argument saying that the state constitution protects the people's right to call for a recall election. Are NC Republicans Caving To Sheriffs' Association? Gov. Pat McCrory (R-NC) seems to be caving to the demands of the NC Sheriffs' Association with regard to pistol purchase permits. According to GRNC, McCrory has instructed the House Republican Caucus to send HB 937 to a conference committee rather than to concur with the Senate version of the bill. However, it should be noted that the House Republicans led by Speaker Thom Tillis are under no obligation to follow any instructions from McCrory. Tillis has announced his intention to run for the US Senate and will need the votes from gun rights supporters if he hopes to win the primary. As GRNC notes below, he needs to be reminded of this. It has become clear that the cabal committed to preserving NC’s embarrassing and obsolete Jim Crow-era pistol permit system is being led by NC Sheriffs' Association Executive Director, Eddie Caldwell. Not an elected Sheriff subject to the will of voters, but rather a lobbyist hired by the NCSA, he is clearly more interested in protecting his cushy job and benefits than the rights of North Carolinians. Worse, Governor Pat McCrory seems to be getting week in the knees in the face of sheriffs' demands, and has instructed the House Republican Caucus to vote not to concur and to send the bill to a House-Senate conference committee to remove the measure. What is at stake, however, is not just the purchase permit repeal, but the entire bill, including restaurant and campus carry. Why? Because if the bill goes to conference committee -- which will give the media and UNC more time to agitate, anything could be removed. Caldwell is apparently trying to protect his nearly $290,000 per year compensation package after being blindsided by the purchase permit repeal addition to HB 937 in the Senate. GRNC has had extensive discussions with Senate Republicans, and we are certain they were sincere in the changes to HB 937 they made. There was no deliberate effort to cut out Eddie Caldwell and NCSA from legislative plans. Currently, there have been no indications that the Governor intends to veto the bill, but he did tell the Republican Caucus that he wants the bill sent to conference committee to change the permit provision to one which "studies" the issue. Representatives for House leadership have indicated willingness to move "a" bill, but have not committed to what will be in it. GRNC opposes the conference committee for the following reasons: As you may or may not know, once both chambers have passed different versions of a bill, it goes back to the first chamber for concurrence. By legislative rules, a bill cannot be amended on concurrence, so removing the PPP provision could only be done by voting not to concur and then sending the bill to a conference committee comprised of members from each chamber. There are several problems with that, not the least of which is that once it goes there, we have absolutely no control over what comes out. Added to that, the media will get additional time to beat on Republicans for weakening amendments. CONTACT ALL NC SHERIFFS: Tell them the rights of NC gun-owning voters are more important than Eddie Caldwell’s pay. TELL SPEAKER TILLIS THE NEXT MOVE IS UP TO HIM: Tillis doesn't have to kowtow to either the NCSA or the Governor. Given his announced bid for Sen. Kay Hagan's seat, it would be shame for him to further alienate gun owners by failing to concur. Therefore, he should move quickly and resolutely to vote to concur. GOVERNOR PAT McCRORY: First, email him BY CLICKING HERE or going to: www.governor.state.nc.us/contact/email-pat and then call him Wednesday morning at (919) 814-2000. Let McCrory know that contrary to what the Sheriffs' Association claims, HB 937 IMPROVES background checks. Even if you already called, call again. EMAIL & CALL SPEAKER THOM TILLIS: Let him know that you appreciate his earlier efforts, but that the Senate has upped the ante and now he needs to resist the power-hungry NC Sheriffs' Assoc. and pass HB 937 AS IS by making sure the House VOTES TO CONCUR. To contact Speaker Tillis, email Thom.Tillis@ncleg.net and call him on Wednesday morning at 919-733-3451. EMAIL NC Sheriffs: Tell them the rights of law-abiding NC gun owners trump the selfish interest of a few Sheriffs. Suggested Subject: "Concur and Approve HB 937!" If you cause House Bill 937 to be sent to conference committee for the pistol purchase permit repeal to be removed, you will be in the position of obstructing Point of Contact background checks for gun purchases. The North Carolina Sheriffs' Association (NCSA) has known for decades about the loophole enabling felons to evade background checks. The National Instant Criminal Background Check System (NICS) has been in existence since 1998. What has the NCSA done to close this loophole? Nothing. And the reason is as old as man himself: Power and money. If the measure dies and a felon uses a purchase permit to buy a firearm and then uses it in a crime, you will be responsible. I strongly urge you to push for immediate House concurrence and final approval. Conference is too dangerous and potentially damaging to what now stands as a bill which balances Second Amendment freedoms with punishing violent predators. I will monitor your actions via Grass Roots North Carolina legislative alerts. Has Bloomberg Bought Another Western State?